What a great product to have and thank you for the coupon. I am a huge fan of Checkout 51 use it all the time. We have a lot of small animals who like to eat in our garden! We also have turkeys who are pulling up everything, will this work for them too? We don't have this problem where we live, but I definitely have some friends who would probably love to hear about this product! Perfect timing. We're about to plant some lettuce and don't want the rabbits to get it this year! We have this! We have four acres and we are avid gardeners. The critters will eat everything, if you let them! This is such a good idea. We definitely need it in our garden. I appreciate that it repels in a safe way. I don't have an issue yet, but I expect I will! I've never heard of Checkout 51. I will be checking it out now though, I love a good savings!! Thankfully we don't have a critter problem here, but we DO have a spider problem! I need to download Checkout51 though! It's nice to know there's something that works that isn't harmful. The savings is nice too. Love that this isn't harmful to the animals. Luckily I don't have this problem but my MIL does. I'll be sure to let her know about this. We have a little dog, so glad to hear this is safe for pets! 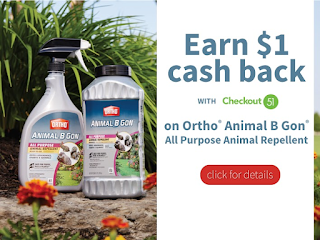 Thanks for the savings tip on a Ortho® Animal B Gon® Animal Repellent product!! Oh we need this Our veggie and fruit garden gets eaten all the time by rabbits!